Hot on the heels of their adventure with the X-Men, Power Pack returns for another titanic team-up... and this time, it's Earth's Mightiest Heroes leading the charge! In this issue: the Marvel Universe's youngest heroes join the battle alongside one of its oldest the legendary Captain America! 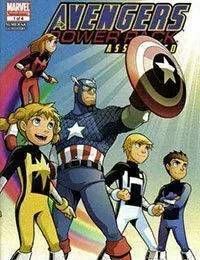 Can the kids help Cap track down a dangerous old foe, or will their youthful inexperience make them four thorns in the Star-Spangled Avenger's side? It's all-ages action and adventure in the mighty Marvel manner! Don't wait for the digest... Join the Pack now!